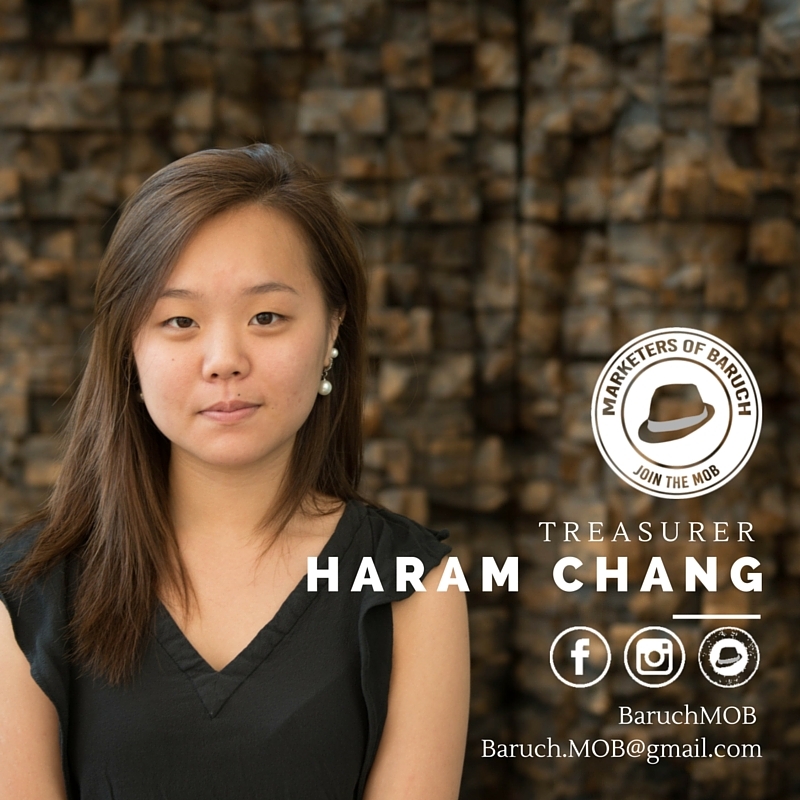 Frustrated with the lack of professional opportunities within my field and the absence of a marketing community, my friend suggested that I revive an old club called Marketers of Baruch. After taking five seconds to digest the idea, I went out and made it happen. Baruch being a commuter school known primarily for their finance and accounting programs, the marketing and advertising community was nonexistent. There were no real career opportunities, networks, or resources for students to turn to. Marketing and advertising students at Baruch are sleeping giants waiting to pounce on any golden opportunity presented to them. The lack of social and professional opportunities has created an unmatched eagerness for them to push to succeed in their professional and personal journeys. Create a community that extends beyond regular club activities and into a group of highly motivated individuals of good character to share common values of grit, community, friendship, and success. We can achieve this by creating a balanced mix of professional and social events. Most importantly, we aim to create a culture of sharing and encouragement through coffee discussions, job postings, group projects, mock interviews, and more. Community: Be part of a community that is not only here to push you to succeed but to also have fun along the way! Growth: Gain hands-on experience by working with real clients, internal workshops, and coffee discussions. Excellence: Set a higher standard for yourself by being surrounded by motivated and passionate students. Influence and be influenced! Moreover, it is integral that our voice remains consistently professional, transparent, organized, and genuine. In order to do this, we had to start from scratch. Back to the drawing board! The very first thing I did was contact the Presidents and board members of the top professional organizations on campus. All I did was ask questions. What events do your members enjoy most? How do you keep your members involved and engaged? How did you go about building a close-knit community? What kind of professional events have been the most successful? How did you establish your club culture? After jotting down notes and coming up with a simple brief, I had to come up with our selling points. What made us unique and why would anyone want to join us? Then it dawned on me - community, growth, and excellence. So I pitched the idea of MOB to my mentors, close friends, and students leaders and the feedback was generally positive - it was safe to move on. I was fortunate enough to be heavily involved with other organizations on campus and it was natural that all my best friends were student leaders. 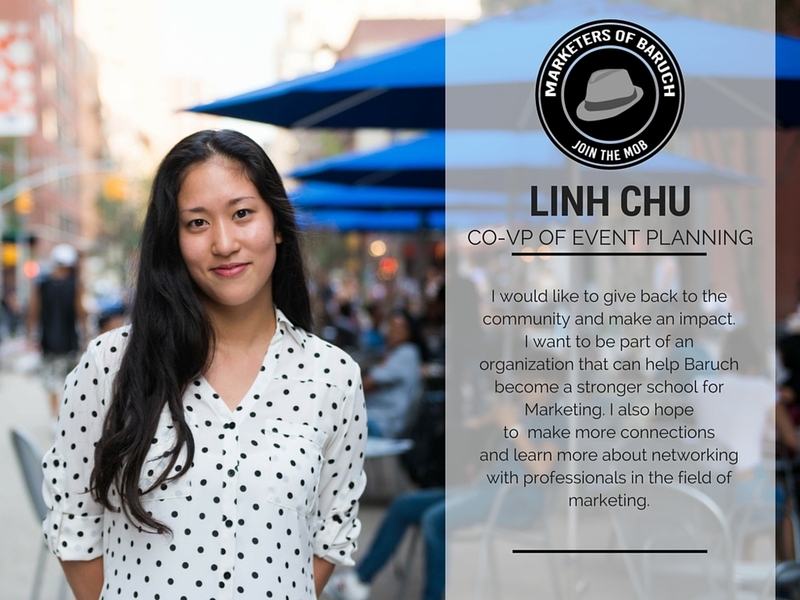 I came up with a shortlist of a potential e-board and as I approached them and pitched my visions and dreams for this club, all of the people I wanted to join my team had a glimmer in their eye. They were just as passionate as I was about going about this! On top of that - they were my friends so I was confident that we would all work well together. 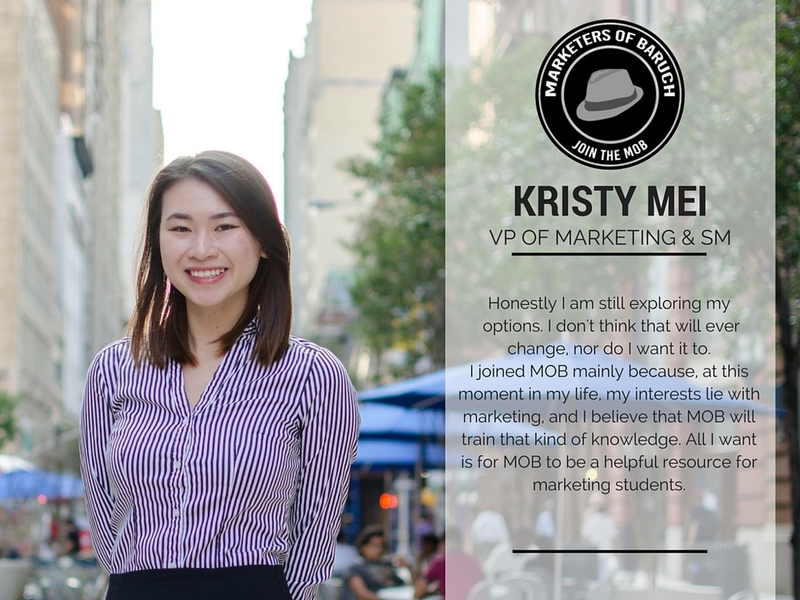 We all shared the same vision: to bring the best marketing resources to Baruch while furthering our personal and professional goals. However, it was time to get down to the smaller organizational details about how this club was going to be run. It was a little tough just approaching students coldly, but turns out that most of the people we accepted into our organization were those we met during this time. Learning from our mistakes, Joeleen put together an awesome sign to hold up during the club fair. We had students lining up just to speak with us and we captured over 100 emails in a few hours! All the executive board members changed their profile pictures and cover photos at peak hours at Sunday night to fill our Facebook feeds as a grand entrance. Inspired by the Dollar Shave Club, our promotional video highlights not only our three values but also our close-knit community. Perhaps my dance moves at the end had something to do with it. Provided a thorough introduction as eboard members, as an organization, the semester-long project, and my personal motivations, journey, and visions for the club. We ended the night in the best way we could - by grabbing some really good Italian food in Union Square! D&D are biweekly roundtable discussions where senior members answer questions for the less-experienced members who bring questions about various topics including networking, recruitment, and more. This fosters a culture of giving back and encouraging each other to succeed. A huge thank you to Nancy Zhu for shooting and editing all these photos!